Plot: Matt Murdock is sworn in as Wilson Fisk’s deputy mayor. Unfortunately, Matt’s new job doesn’t affect Fisk’s plans directly but he can still learn things to use as Daredevil. However Daredevil drops his focus on Fisk when he learns the Inhuman serial killer, Muse, escaped prison. Story: Charles Soule’s writing explains the deputy mayor position in a clear way. 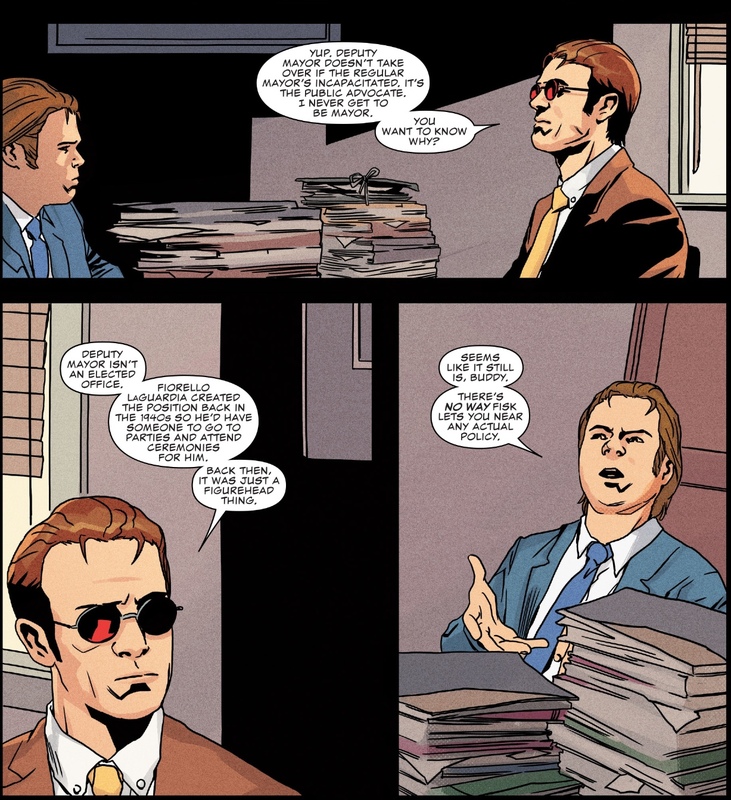 Matt tells Foggy Nelson what the job really means. Plus Matt references the original mayor who created the position. At first readers thought Matt’s new job would mean being Fisk’s right-hand man, but now they know that he’s just in a figurehead position. Also Soule’s history as a lawyer shows in his writing and proves that he’s the right author for Daredevil. While Matt can’t fight Fisk in City Hall, he can stop some of Fisk’s plans on the streets. Having Matt overhear Fisk’s plans is pretty creative. In the past Matt would learn things as Daredevil so he could fight in the court room. 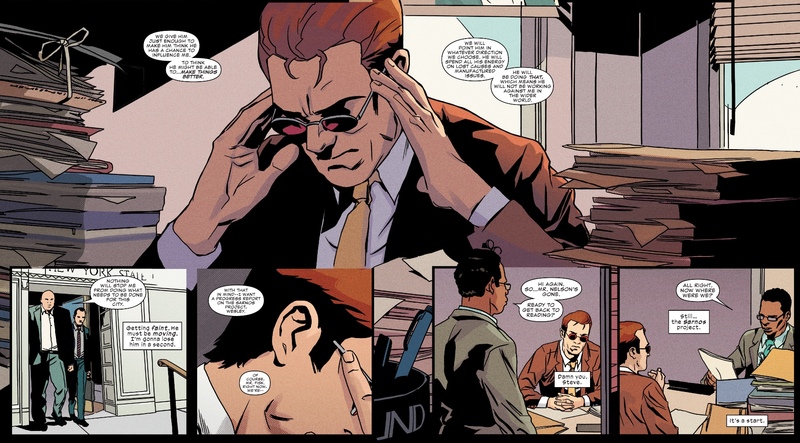 Now, he’s learning things as Matt Murdock so he can take Fisk down as Daredevil. This is an awesome new take on Murdock and Fisk’s classic cat and mouse dynamic. My only problem with this issue is the re-introduction of Muse. Muse didn’t have much of a personality and was a very one-and-done villain. The only reason he’s back now is to kill time for the title’s 600th issue. Also the way the story shifts its focus to Muse feels very sudden and unexpected. Hopefully this next story with Muse will end quickly so we can get back to Mayor Fisk. Art: This issue has good artwork. Matt Milla makes some good color choices for Daredevil’s costume. While the costume is still red, it’s mostly shadowed. This tells the reader that Daredevil is a darker character and he does his best work in the shadows. Plus, Stefano Landini does some excellent pencil work. I liked how he drew Foggy Nelson with longer hair. This makes Foggy look more like Elden Henson, who portrays Foggy on the Daredevil Netflix series. Also Landini’s facial expressions are on point. The characters’ faces are easy to read and match their emotions with their dialogue. 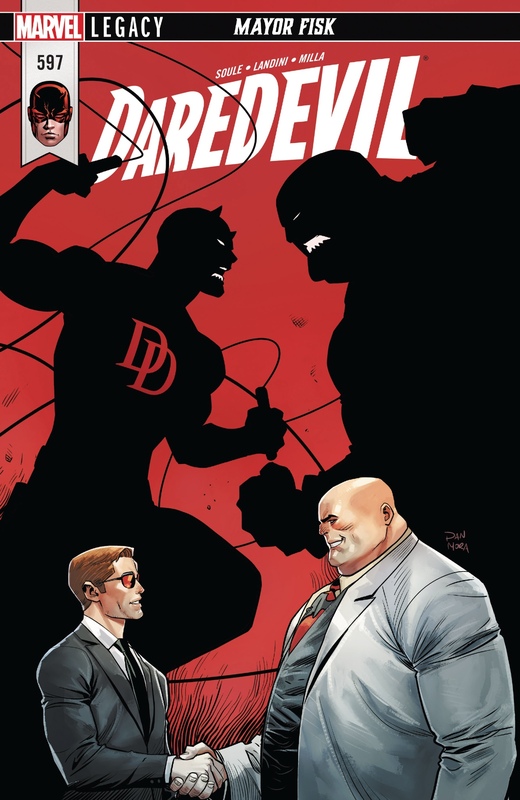 Verdict: This issue was a great setup for Daredevil’s next move against Wilson Fisk. However this gets derailed once the hero finds out Muse escaped prison. Once the issue shifted gears this was when my focus went out. Nevertheless, this issue has great writing and stunning artwork. If you want to read it, I suggest reading the two preceding issues (#’s 595-596) before this one. Marvel Comics Reveals Darth Vader’s Red Lightsaber origin!